Bali Hotel Alam KulKul Boutique Resort is the popular hotel located on Jalan Pantai Kuta, where is good access to sightseeing and shopping. It has high roof, and the wood carving doll lamp on bed side, etc. 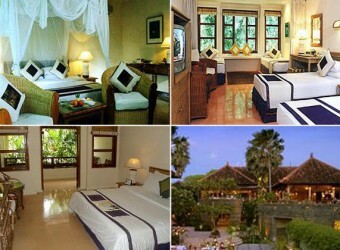 there are many warm Bali style interior with exotic atmosphere. The bathroom is half outside architecture, so it is openhearted atmosphere.